BEHIND PowerJared Polec scores a behind from a Turnover. Richmond has scored seven goals to one from stoppages. 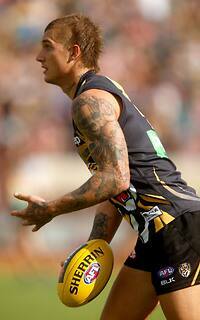 It has won clearances 38 to 27, with Dustin Martin and Shaun Grigg winning seven each. BEHIND PowerJake Neade scores a behind from a Turnover. 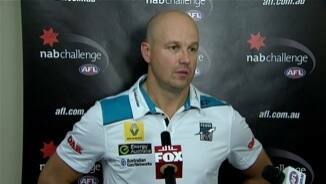 Port Adelaide InterchangeTom Logan was changed with Paul Stewart due to an injury. BEHIND TigersDustin Martin scores a behind from a Turnover. 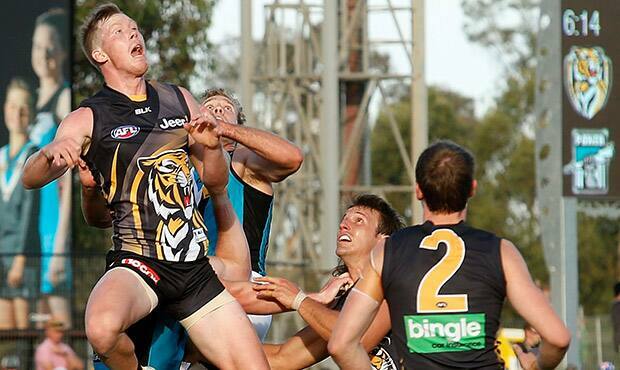 Richmond InterchangeRicky Petterd was changed with Reece Conca due to an injury. RUSHED BEHIND to Power from a Turnover. GOAL PowerAaron Young scores a goal from a Stoppage. Richmond InterchangeSam Lloyd was changed with Kane Lambert and is possibly out for the game. GOAL PowerJarrad Redden scores a goal from a Turnover. GOAL TigersSam Lloyd scores a goal from a Kickin. BEHIND PowerKarl Amon scores a behind from a Turnover. BEHIND PowerJesse Palmer scores a behind from a Stoppage. 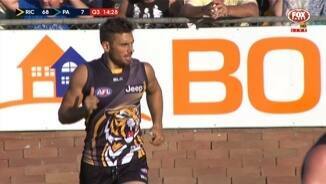 Shane Edwards has kicked two goals and a behind from set shots today. In 2014 he had the best accuracy (86 per cent) of any player in the competition with 10 or more set shots. GOAL TigersShane Edwards scores a goal from a Turnover. GOAL TigersJake Batchelor scores a goal from a Turnover. GOAL PowerMatthew Broadbent scores a goal from a Turnover. BEHIND PowerSam Gray scores a behind from a Stoppage. GOAL TigersSam Lloyd scores a goal from a Turnover. BEHIND TigersIvan Maric scores a behind from a Stoppage. GOAL TigersSam Lloyd scores a goal from a Stoppage. BEHIND TigersKamdyn McIntosh scores a behind from a Stoppage. From 15 chains starting in the defensive midfield Richmond has launched 10 inside 50s. Port Adelaide has converted just four of 14 from this zone. Port Adelaide InterchangeSam Russell was substituted for Jasper Pittard. GOAL PowerTom Clurey scores a goal from a Turnover. Kane Mitchellis Port Adelaide's leading ball-winner with 16 touches. His AFL career-high is 20 disposals, but 11 of his 23 games have seen him wear the green or red substitute vests. BEHIND TigersBrandon Ellis scores a behind from a Turnover. BEHIND TigersBrett Deledio scores a behind from a Turnover. Port Adelaide InterchangeMitch Harvey was changed with Andrew Moore due to an injury. 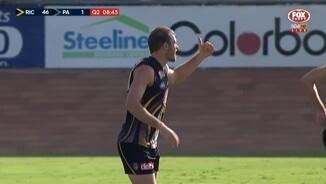 Richmond InterchangeRicky Petterd was changed with Taylor Hunt due to the blood rule. Richmond is winning contested possessions 70 to 41, including 46 to 29 in the midfield. 12 Richmond players finished the first half with a score assist. No team in the AFL last season had more than 11 players with an assist in the first half. GOAL TigersTaylor Hunt scores a goal from a Stoppage. GOAL PowerAaron Young scores a goal from a Turnover. Shane Edwards has won an equal game high 12 disposals. He has been involved in six of Richmond's scores, the most of any player. SUPERGOAL TigersBen Lennon scores a supergoal from a Stoppage. RUSHED BEHIND to Power from a Stoppage. Ivan Maric has won 15 hitouts from 21 ruck contests. Five have gone to a teammate's advantage. GOAL TigersBrandon Ellis scores a goal from a Stoppage. BEHIND TigersShane Edwards scores a behind from a Turnover. BEHIND TigersKamdyn McIntosh scores a behind from a Turnover. Johann Wagner laid three tackles in the opening quarterequal with Jack Riewoldt as a game-high. Port Adelaide has opted to run with the ball, with 21 handballs to just 15 kicks. 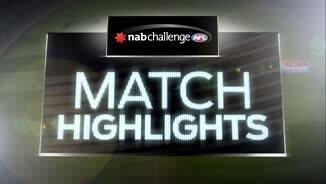 Richmond with the breeze has 10 handballs to 28 kicks. Seven of Richmond's first eight scores have come from a teammate's assist, coming from seven different players. The AFL Average is 60 per cent of scores coming from assists. GOAL TigersTy Vickery scores a goal from a Stoppage. GOAL TigersJack Riewoldt scores a goal from a Turnover. GOAL TigersNathan Gordon scores a goal from a Turnover. Richmond leads by 3.2 (20) to no score after eight minutes, leading inside 50s 81 and dominating territory with 85 per cent time in forward half. GOAL TigersShane Edwards scores a goal from a Stoppage. GOAL TigersBen Lennon scores a goal from a Turnover. GOAL TigersKane Lambert scores a goal from a Turnover. Starting subs: RichmondL.McBean, T.Elton. Port Adelaide - S.Russell (Only using 25 of a possible 26 players). Welcome to Lavington Sports Ground for the Richmond v Port Adelaide Round 3 clash. DAMIEN Hardwick warned the competition that ‘Dustin Martin The Midfielder’ would be launched in 2015. On Saturday, the football world got its first look at how devastating the move of the 23-year-old into the centre could be. As Richmond cruised to a 66-point shellacking of a dramatically undermanned Port Adelaide side at Lavington Sports Ground in Albury, Martin was the standout. He had 27 touches and won seven clearances after starting in the centre circle, burst through packs, fended off opponents and still found time to provide a presence up forward. It was the highlight of an otherwise uninspiring affair, with the young Power outfit overwhelmed by a nearly full-strength Tiger line-up, captained by Brett Deledio. "I thought he was really good," Hardwick said of Martin. 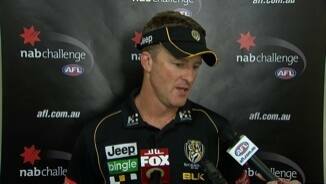 "I think he had 11 contested ball and seven clearances. It's something we were looking for him to improve in his game and we were pretty pleased with what he did today. "The consistency of his output was probably a little bit scratchy early but got better as the game went on, which was always going to happen. "He's got a way to go but we're pleased with the results so far." Four goals to small forward Sam Lloyd, who played eight games in his first season last year, was another positive in the lopsided contest. The early scenes were reminiscent of last year's elimination final between the two teams, except it was the Tigers directing one-way traffic this time and the Power left to work out how to stop the flood. With Shane Edwards, Shaun Grigg and Deledio starting well and Ivan Maric dominating Jarrad Redden in the ruck, the Tigers raced to a 38-0 lead by quarter-time. So comprehensive was the Tigers' dominance that the Power's first score – a rushed behind seven minutes into the second term – was met with jeers from the pro-Richmond crowd. 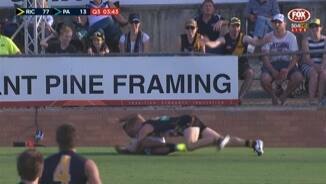 Port’s first goal, which went to Aaron Young 10 minutes later, received the same treatment. With the exception of Trent Cotchin, who is expected to return from hamstring soreness in the coming weeks, the Tigers had their top 10 placegetters from last year's best and fairest count on the field. The Power had none of theirs. Captain Travis Boak, Robbie Gray, Justin Westhoff, Jay Schulz, Brad Ebert and Alipate Carlile didn't make the trip, and Ollie Wines, Matthew Lobbe and Tom Jonas were pulled out when the squad was trimmed just before the bounce. Defender Jarman Impey also didn't play after developing hamstring soreness overnight. Matthew Broadbent captained and was one of their better players, along with Kane Mitchell and Paul Stewart while Nathan Krakouer got his hands on the ball 10 times across half back and tried to get them going. But a young forward line, built around The Recruit’s Johann Wagner and another first-gamer in Jesse Palmer, struggled to match the likes of Troy Chaplin and Alex Rance. Port Adelaide assistant coach Matthew Nicks admitted the young group didn't handle the pressure early but said that sort of lopsided game could teach players more than easy wins. "The guys that step up when the game is like it is at quarter-time, they're the guys you know when the chips are down, they're going to give you something," Nicks said. "We saw that today, there are some guys we'll probably need to do a lot more work with but the pleasing thing out of the whole game is it didn't blow out, it didn't end up being a 100-point loss so that's a real positive we'll take away." The Tigers' pressure across the ground was excellent in the first half as they monstered the young Power side and they easily found targets. 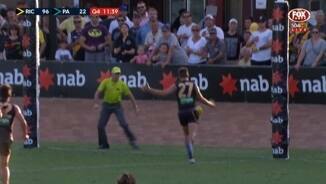 They handed Jack Riewoldt and Ivan Maric the red vests at three-quarter time and the sting went out of the game late, with Port managing three goals in the fourth term. Riewoldt took four marks and kicked one goal, appearing almost too unselfish at times when he turned the ball over trying to find a teammate rather than taking a shot at goal himself. Richmond: Their backline looks good and they've got reserves with David Astbury yet to appear this pre-season and Matt Dea another option. A fit Ivan Maric is a massive bonus for the Tigers after he missed nearly all of last pre-season and Sam Lloyd looks to be nudging ahead in the race to fill the role across half forward. It also looks like the Tigers are going to persevere with Steve Morris in attack, although he didn't have a huge game, and Ben Lennon is also spending more time forward of the ball. Port Adelaide: Port's young forwards are a bit away yet. 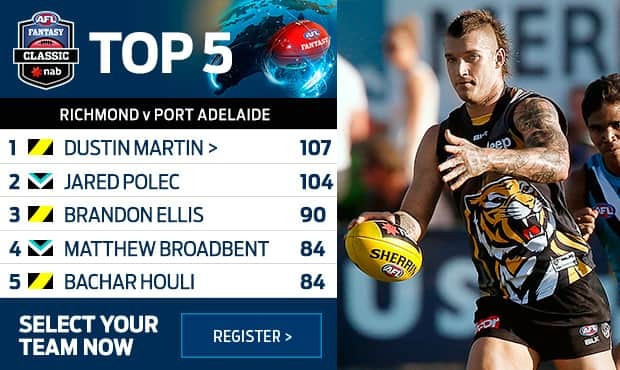 They left their A-team in Adelaide and it showed, with the team taking just 11 marks inside 50 to the Tigers' 18 – the majority of which came in the last quarter. They were a shadow of the team that thumped Richmond six months ago with just too many players out and a bunch of new faces in. Ruckman Jarrad Redden, who last played in round 10, 2013, got through the game and ended it with a goal, and showed signs he can be important for the Power this year if he stays fit. Richmond: There were no new faces for the Tigers after they played eight against the Western Bulldogs two weeks ago, but Kane Lambert looked good in his second game with 12 disposals and Taylor Hunt had 19. Port Adelaide: There was plenty of interest in how the winner of reality show The Recruit Johann Wagner would go in his first competitive hit-out, but he didn't have many opportunities to touch the ball given it was mainly down the other end. Wagner had Troy Chaplin, Alex Rance and Dylan Grimes for opponents when he was stationed at full forward, and took one nice mark on the lead after Rance turned it over but missed everything with his set shot. It was also a tough afternoon for Jesse Palmer and Dougal Howard, who joined Wagner in the forward line and were faced with pretty much the Tigers' best back set up. Sam Russell came on at three-quarter time and didn't touch the ball but laid four tackles. Richmond: Jack Riewoldt and Ivan Maric subbed out at three-quarter time for Todd Elton and Liam McBean. Port Adelaide: Jasper Pittard subbed out at three-quarter time for Sam Russell.